Nostalgia alone doesn't make a game great. If you could go back and redo anything you've created, would you? The team at Insomniac Games was able to do that and give the original Ratchet and Clank from 2002 a complete overhaul. But it isn't a "definitive edition" like we've seen with Uncharted or Gears of War. Insomniac isn't taking a page from Resident Evil's book and just rereleasing the original game, warts and all, on a new console, either. Creative Director Chad Dezern says doing a quick-and-dirty nostalgia grab like that didn't jibe with what the team ultimately wanted to do. "It's about trying to make a game that's great on its own merits and not just because you remember what it was like the first time you played," he says. "There are times I'd want to play a game in its exact original format almost to see how things have changed over the years," he continues. "That's not exactly what we were after for this one." And besides, they had already done something like that on the PlayStation 3 in 2012. With the new Ratchet and Clank, Insomniac has the opportunity to reconsider the game using everything it's learned in the intervening 14 years. How would Insomniac approach this as a foundation for future games while maintaining the spirit of the original? "Apply everything we've realized about Ratchet and his origins that we didn't necessarily know at the time we were making it," Derzen says. And unlike the glut of HD remasters that have been released on the PlayStation 4, Wii U and Xbox One, it actually does look and feel like a modern game rather than a time capsule piece. 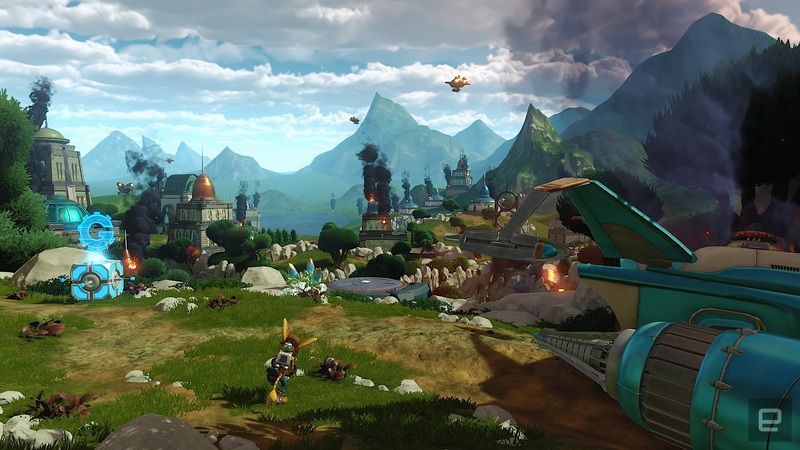 This new Ratchet and Clank is what the team would've made if the PS4 had existed in 2002. That means back-of-the-box bullet points like gorgeous graphics, bigger worlds, more to see and do and better narrative structure. But somehow it doesn't feel like a cash-grab; the love is tangible here. For example, Dezern notes that with the first game, it almost felt as if difficulty in shooting was a core design philosophy. That wouldn't fly in 2016. So the team added much-needed, proper third-person shooter controls that can stand alongside any modern release, with the ability to strafe and better use an incredibly responsive dual-analog aiming method. "We wanted to design a game around 'it feels really good to shoot' as a core premise," he says. That had some unexpected consequences: Every enemy encounter had to be reworked given the changes to the game's arsenal and controls. "Changing the shooting mechanic changes everything in the game when it's based around that," Dezern adds. Gunplay isn't where the revisions end. Every planet has been expanded with new areas to explore; hoverboarding has been reworked and the adorable, eponymous Clank's gameplay segments have been redesigned. Based on the preview build I played, none of it feels bolted on, a la Twilight Princess HD's challenge dungeon, either, because rather than only one aspect being new, everything is. From an entertainment perspective, it's awesome, but it trades historical accuracy for modern sensibilities and power. It's something Dezern is keenly aware of. "As a developer, you always worry that things move so quickly, progress happens so quickly, that your work is invalidated," he says. "None of us like that feeling." He says things such as streaming classic games from the likes of PlayStation Now or GameFly and releasing HD remasters are vital to the industry from an artistic standpoint because it makes gaming less disposable. For all the things that video games get right, historical preservation isn't one of them. But it is getting better. "It feels really good that we're in a place where we can start really building on existing work instead of feeling like each console generation invalidates the work of the previous generation," Dezern says. That's not to say Insomniac doesn't value its past. If anything, this new game is a testament to how much the studio cares about one of its core franchises. In fact, the upcoming feature film uses a lot of the core themes and narrative beats from the original as its basis because they're intrinsic to the franchise's story. Ratchet is still an orphan on the arid planet Veldin, Captain Qwark is still an egocentric doofus. The overarching themes are present in the new game, but they're told in a very modern way, breaking the fourth wall at times and recognizing that there's a bit of revisionist history going on. It's still incredibly tight in terms of narrative, though -- something Dezern admits wasn't the case with the 2002 game. "It was a little bit rambling because we made some things up along as we went," he says. Working alongside production house Rainmaker Entertainment, which has worked on video game trailers and cutscenes prior, had some surprising benefits. Dezern says the movie and game were a "true co-development," with Insomniac and Rainmaker trading back and forth throughout the entire process. For instance, Insomniac would create a 3D model of a character or environment and send it to Rainmaker so it could be added to the movie. Rainmaker would send its version back so Insomniac could alter it to add it into the game, so there would be parity between the pieces. "Every single element has been touched by both parties in a lot of cases," Dezern says. "There have even been times where we've taken film shots and matched them up as precisely as we can because we want the whole thing to feel cohesive and like it's the same universe presented in two different ways." The cinematic to-and-fro was an asset for other reasons, too. Insomniac uses the same color-correction tools as movies and overall, the game feels incredibly filmic in presentation and play. Animations are buttery smooth; each scene is bursting with activity and details, and it all looks absolutely gorgeous. 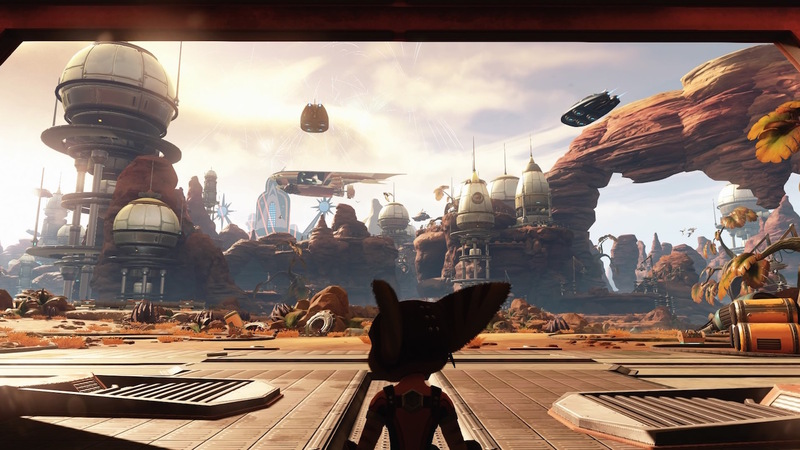 For decades, game makers have been clamoring for the moment when users feel like they are playing a Pixar movie, and Ratchet and Clank could finally be it. Dezern says that's because the power of the hardware means few compromises to artistic vision. "Suddenly it's 'Let's make the right decision for the game we're making', and not 'Let's make the only decision we can because of the constraints we're under."